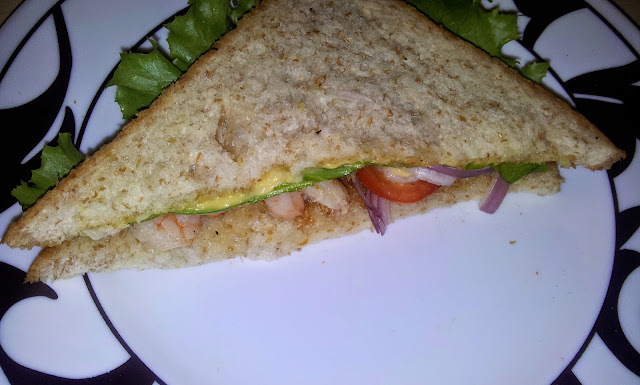 If you and your family likes seafood then what else can be more healthy nutritious and easy to make meal to start a day than shrimp sandwich. Its also good for kid's lunch box . 200 grams fresh shrimps washed and deveined. i am using medium size shrimps. Add 1 Tbsp of butter in pan and place shrimp , add salt and black pepper . Cook just for a minute and then off gas and close the lid . Shrimps does not take time to cook . If you cook for long period they would get hard and rubber like in texture . Place chedder cheese slice on top of follwed by lettuce , onion and tomato slices . Top up with second slice and dab with your hands . Or you can grill in your oven to do the same for 1/2 minute. cut and serve . 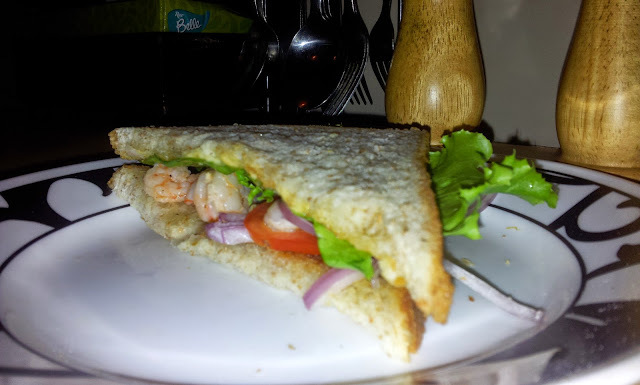 If you like your shrimps to be binded in sandwitch then try my "shrimp patties" recipe and make delicious sandwich which are easy healthy , tasty and loved by kids.